It’s been more than two years since I moved out of New York City. I live about two-and-a-half hours north of the city in the state capital, where I am from originally, but my four years in New York City–Brooklyn in particular–have definately shaped me. I always saw myself as living in New York City some day and in May of 2001, recovering from a bout of depression suffered at college in Boston, I took the summer to live with friends in Brooklyn instead of going home to my parents’ place. I’d been to the city many times, but it took me just three weeks there to decide I wanted to live there and so I stayed, transferring to my alma mater, Brooklyn College where I would eventually graduate. I really love that place and as expensive, grimey and frustrating as it can be, I miss it and surely will choose to live there again at some point. 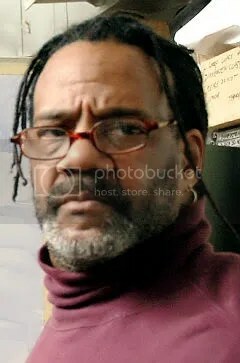 This morning the New York Times City Room blog was updated with an article about the late Marvin Franklin, a Metropolitan Transit Authority track worker who was killed last spring while doing work on the notoriously pokey G-train line in Brooklyn. Franklin’s story is one that is not particuarly dramatic, but interesting all the same. A lot of people take jobs that are not personally interesting or invigorating to them. They spend precious years of their lives toiling away at projects that speak neither to their personal ambitions or their soul. Marvin Franklin was apparently different. 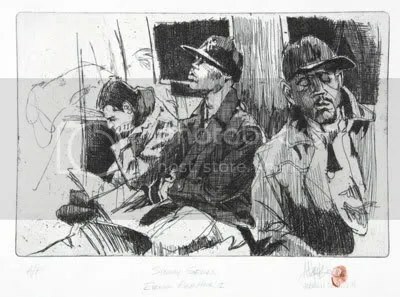 The veteran transit worker was an experienced artist who used the setting of his work-a-day life as inspiration for his drawings and paintings. Three years away from retirement, Franklin, according to several articles about his death, was gearing up for a career teaching fine arts. Unfortunately for Mr. Franklin, a subway car crushed him to death before he could realize his ambition. Fortunately for us, Mr. Franklin’s work is on display at the MTA museum in Brooklyn. 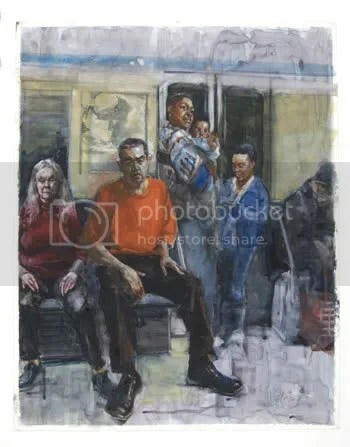 Because Mr. Franklin did so much work reflecting one of the largest transit systems in the world, the museum with the assistance of his union, has selected to display his images of subway riders and homeless station dwellers. New York City’s subway system are the veins that carry it’s lifeblood. As corny as that sounds, anyone who has lived in New York City for even a few months knows that its trains and cavernous, dark tunnels become a part of their life. All of us who have lived in New York City have waited with sleepy eyes and tired muscles at some stop late at night be it Bay Ridge Avenue in Brooklyn, 170th in the Bronx or Whitehall in Manhattan, waiting, waiting, waiting for our train to arrive. We’ve all seen minutae, malaise and drama on the train. I once saw a man beat his girlfriend on a Bronx-bound 4-train, a drunk Brooklyn teenager drop his trousers and pee all over an R-Train car or a rude evangelist get booed out of a car. The train is a stage in New York’s theater. It unites all New Yorkers, visitors and tourists, if even for a three station trip. Looking at pictures of Mr. Franklin’s art work, I can see that the artist was able to really capture that. Not knowing much about art, I can only say it reminds me a little bit about some of Edward Hopper’s New York City scenes. People become a part of the setting while at the same time the subject. I look forward to visiting his exhibition in Brooklyn the next time I go down to the city. Looking at his pictures really makes me miss the place that I cursed and shouted at under my breath. It’s too bad he didn’t long enough live to teach his craft.